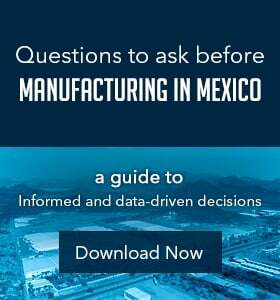 Expanding to Mexico has long been a way for manufacturers in numerous industries to reduce their production costs while still fabricating high-quality products. One of the country's rising specialties is in aerospace part production and aerospace manufacturing as a whole, which has seen consistent year-over-year growth for nearly all of the past decade. In fact, according to FEMIA, the Mexican Federation of the Aerospace Industry, aerospace manufacturing has grown at an annual rate of 15% and added 50,000 jobs by 2017. With Mexico's specialization in the production of aerospace materials and the need for aviation parts on the rise, the country is set to become an aerospace manufacturing powerhouse. According to the San Antonio Express-News, Mexico surpassed China in 2008 as the largest exporter of aerospace materials to the U.S. and hasn't looked back. While the industry is clustered in numerous areas of the country, such as Sonora and Queretaro, manufacturers have expanded into many parts of Mexico. Baja California and Chihuahua are two of the areas that have seen strong aerospace growth as more U.S. businesses invest in offshoring to the growing aviation industrial clusters. Americas Quarterly reported Mexico had 150 aerospace plants in 2007 that exported approximately $2.7 billion worth of parts. By 2016, there were more than 300 aviation factories with exports of $4.75 billion. FEMIA also projected an 11% overall growth for the industry with annual exports of $8 billion in the future. The entirety of the country is focused on expanding its aerospace specialty and has seen strong results. One of the major reasons for the growth of the aviation sector was the country's focus on clusters, according to the source. 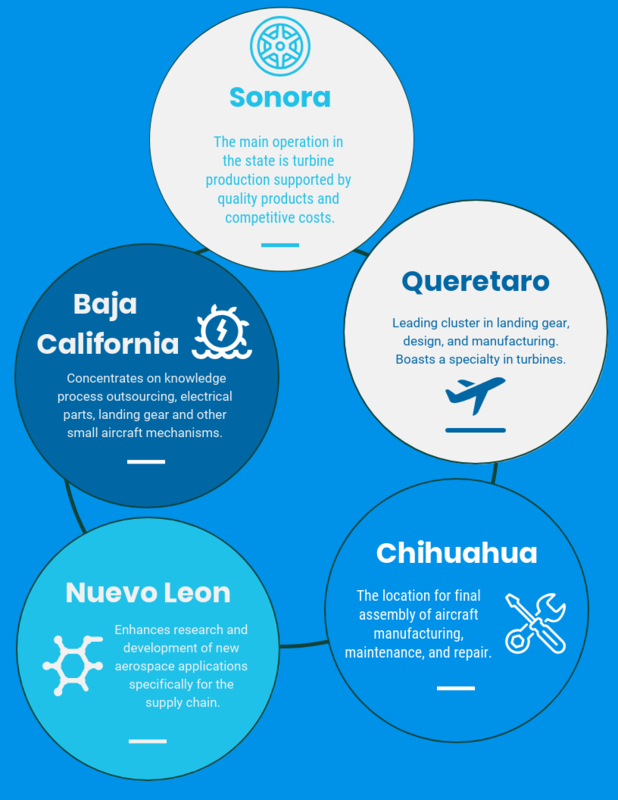 Mexico's aerospace industry has five key clusters: Sonora, Baja California, Chihuahua, Nuevo Leon, and Queretaro. While activity in each of these geographic regions depends on the manufacturers centered there, each drives the aviation industry in the country and contributes to the overall success of aerospace production. Sonora's cluster maintains a specialty in supply chain manufacturers that support the rest of the country. The main operation in the state is turbine production supported by quality products and competitive costs. Much of the production is done within the coastal region that originally started with automotive production and branched out to aviation. Baja California concentrates on knowledge process outsourcing, electrical plants, and fuselage systems or landing gear and other small aircraft mechanisms. The state is also a main logistics point at the border that fosters multiple industry powerhouses with equal access to California's manufacturing industry. Chihuahua specializes as the location for final assembly of aircraft manufacturing, maintenance, and repair. The cluster also produces aerospace parts including seats, slides and rafts, sheet metal, and harnesses. As a border state, Chihuahua is another hub that boasts a robust international logistics infrastructure. Nuevo Leon works to enhance research and development of new aerospace applications specifically for the supply chain. The state's sector in design and engineering is boosted by the skilled workforce of engineers that graduate from one of the country's top universities located in the state's capital Monterrey. Queretaro is the leading cluster in landing gear design and manufacturing, and also boasts a specialty in turbines. Although not a border state, Queretaro is a 2 hour drive from Mexico City, boasting connections to other industry hubs. Each of the clusters maintains their own specialty and contributes to the overall aerospace industry in Mexico at large. With projections of higher industry growth, aerospace manufacturing in Mexico has become a powerhouse through strategic focus on growth within multiple states.